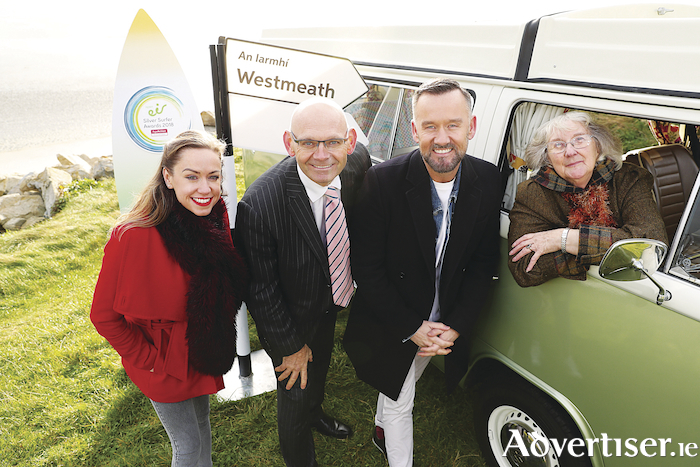 Pictured at the launch of the Open eir Silver Surfer awards are (L-R): Michelle Toner, Head of CSR, eir; John Church, CEO, Age Action; Brendan Courtney, Age Action Ambassador; Betty Smith, 2017 award winner. Open eir has announced that the 2018 Silver Surfer awards are open for Westmeath nominations. Recent CSO figures show that almost half of Irish people aged over 60 have never used the internet, a disturbing statistic in an increasingly online society. The overall aim of the open eir Silver Surfer Awards is to raise awareness among older people of the benefits of getting online and to encourage those who are not online to give it a try by celebrating those older people already showing the way. IT Tutor(s ) of the Year Award – An individual or group of any age who provide voluntary support to older learners. Calling all Westmeath’s Silver Surfers!